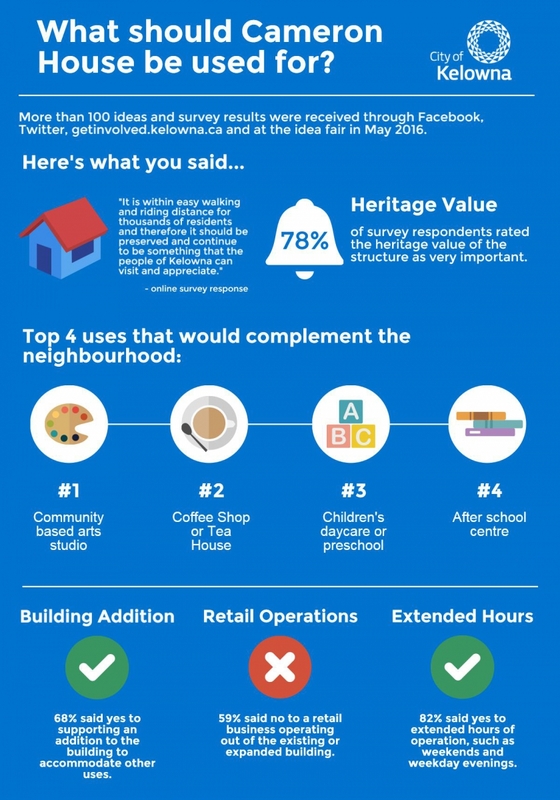 An Idea Fair was held on May 12, 2016 to gather input from the community to identify activities and uses that are compatible with the heritage building, Cameron Park and the surrounding neighbourhood. It is our intention to use the community feedback to seek a private or not-for-profit partner to assist in financing capital improvements for the building and adjoining site. Built in 1928, the Cameron House is a 1.5-storey, log construction home located on the Guisachan property in Kelowna’s South Pandosy neighbourhood. Once the home of a prominent local family, Cameron House holds special significance to the community. Valued for its unusual architectural style, landscaped park setting and role in community life now and throughout its history, the revitalization of this heritage building has the potential to contribute to the vibrancy of the neighbourhood. Cameron House is a Kelowna heritage asset listed on the City’s Heritage Register. Over the years the building has housed several tenants, including most recently a children’s daycare. The building is currently unoccupied and in need of extensive upgrades before being suitable for occupancy. For more information on this building, visit the Cameron House page on the Heritage Register.